Home » Yoga & Health » What are the Different Types of Yoga that Work Best for Me? In considering what type of yoga is best for me, we need to consider the types of yoga practice that are directed at creating the highest level of energy, vitality and freedom. The only way to do this is to work with yourself, not against yourself. Whether we are doing a 90-minute class of Power Yoga or a 45-minute Restorative Yoga class, the type of yoga class or the yoga pose that is best will be very individual in nature. 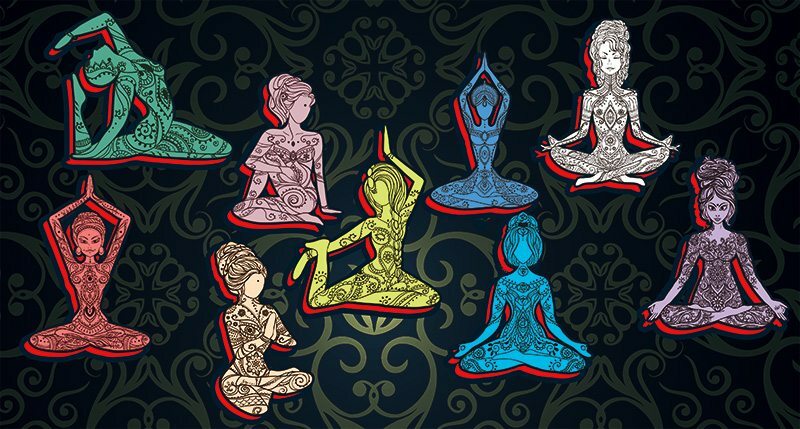 Whether we gravitate towards yin yoga, ashtanga or a power yoga class, the yoga types we find most beneficial to us depend upon our life experiences and the genetic dispositions that make us different. We want to encourage you to try a variety of different types of yoga to discover what type of yoga is best for you. Because all of the different styles of yoga can be confusing, we’ve put together a list of what are the “top styles of yoga” out there. We always encourage everyone to explore a variety of our online yoga styles either on our site at Power Yoga Videos or many other great online yoga sites or classes out there. In Sanskrit, Ashtanga refers to the eight limbs of Yoga described by Patanjali. One lineage of Ashtanga is founded by K. Pattabhi Jois (1915-2009) and now continued by his grandson Sharat. Pattabhi’s teachings and presence as well as his students David Williams, David Swenson, Doug Swenson, Tim Miller, Richard Freeman, Danny Paradise and Bryan Kest had a profound impact on yoga around the world. Viewed from a distance, and commonly understood so in the West, the practice of Ashtanga Yoga appears to be a set of hatha yoga postures. However, there is truly a whole world of other deeper realms at play beneath the surface of this visible physical side of the practice, where the asanas are merely tools with which use to harness the energetic and spiritual aspect of yoga. This system of practice creates five elements which include bandhas (internal energy channels), ujjayi breathing, asana (specific sequencing), drishti (focus of gaze) and vinyasa (alignment of breath and movement). Through the application of the teachings and principles, Ashtanga Yoga teaches a holistic approach to yoga and living. The Bikram yoga style specializes in using the heated environment. Bikram is a comprehensive method of yoga that includes all the components of fitness: muscular strength, muscular endurance, cardiovascular flexibility and weight loss. The overall objective is to create a fit body and mind, allowing the physical self to unify with the spiritual self. The founder of the hot yoga trend, Bikram Choudhury, was a gold medal Olympic weight lifter in 1963 and is a disciple of Bishnu Ghosh, brother of Paramahansa Yogananda, (Autobiography of a Yogi). Bikram yoga’s heated practice promotes increased flexibility, detoxification, and prevention of injuries. Bikram experimented with increased practice temperatures after noticing that the increased temperature made people sweat and exert themselves more in class. He progressively continued to increase the heat, seeing that as they sweat more they associated this with a better workout. Most Bikram yoga practices are typically done in 95-105 °F. Most Bikram yoga classes today happen in rooms heated to 40 degrees Celsius (104 degrees Fahrenheit). Heat has in many historic traditions been utilized to create transformative and healing environments, such as the use of steam baths in ayurveda to facilitate sweating. Hatha Yoga is the foundation of all Physical Yoga styles. The essence of hatha yoga is working with “ha” and “tha,” the two major nadis or currents that dominate our experience of the world. In the sanskrit language of yoga, “ha” and “tha” are the solar and lunar currents representing the dual nature of manifestation. It essentially means the balance of Sun and Moon. The practice of Hatha yoga includes the way towards realization through rigorous discipline. Hatha incorporates Asanas (postures), Pranayama (regulated breathing), meditation (Dharana & Dhyana) and kundalini (Laya Yoga) into a complete system for developing one’s highest qualities of body and mind. Typically the Hatha Yoga poses (asanas) are approached in a calm, meditative environment, where practitioners sit quietly for a few moments, then begin the series, slowly, with control and grace. Awareness of calming of the mind and breath is held as the body performs the various poses selected for the practice session. Power Yoga, a term aptly coined by founder of Poweryoga.com, Bryan Kest, means “to empower” or “a powerful yoga practice” Power Yoga is much more than a physical practice – as the goal is wellness. So, the benefits of Power Yoga are multi-faceted, covering both mind and body. In terms of the physical benefits of Power Yoga, it is the ultimate cross-training, as it attempts to go through every nook and cranny of the body and cover every aspect of physical fitness. With this practice, you have strength, flexibility, stamina, cardio and balance – it’s a multi-dynamic approach towards wellness. Within this, we also address the mental state, as we challenge benevolent mental qualities actually stimulating growth!! As well as creating a safe place to “practice” living. What’s meant by this is that life is challenging, and how we respond to these challenges has a huge affect on our health. Remember the stress that’s hurting us does not happen to us but how we respond to what’s happening to us. There is a lot of room for personalizing the experience of Power Yoga which allows it to conform to our uniqueness rather than forcing us to conform to dogma. The benefits actually transcend the physical practice and permeate your whole life. Power Yoga was not developed to make you look flexible, strong, skinny, pretty or young, it was developed to create wellness which is a by-product of benevolence! Prenatal Yoga sequences focus on creating balance in the body during pregnancy for increased well-being. Prenatal yoga breathing techniques are utilized to help reduce or manage shortness of breath during pregnancy and assist in working through contractions during labor. Prenatal yoga encourages a gentle stretching approach to the asanas, with a focus on moving areas of your body differently, such as your neck and arms, in order to better achieve their full range of motion. Restorative yoga classes focus on utilizing deeper belly breathing with the passive holding of poses for long periods of time. Restorative yoga often utilizes blocks, blankets and yoga bolsters to allow for improved alignment of the body and support a deeper relaxation of muscles. One of the most popular styles of yoga in the U.S., Vinyasa yoga is a dynamic set of flowing poses that focuses on coordination of breath and movement. It is a very physically active form of yoga. It began with Krishnamacharya who later passed it on to Pattabhi Jois. Many modern forms of yoga comprise this sequencing and breathing pattern and can be considered Vinyasa yoga, including Anusara Yoga, Jivamukti, Ashtanga, Power Yoga, and Prana Flow. Yin Yoga aims to direct the stimulation created by the asana into deeper areas beyond the superficial and muscular tissues. Yin Yoga works the connective tissues of the ligaments, fasciae, joints and bones. A significant characteristic is the long held, passive nature of the postures. This style of yoga encourages a quieter or passive attitude towards the practice in order to balance our physical, mental, and emotional equilibrium by integrating the softer “Yin-like”, contemplative ways of being with our normal active “Yang-like” way of life we are so often compelled by. It is simple yet, often challenging, as it can be quite intensive due to the long period of holding of the postures, which typically lasts anywhere from five to twenty minutes. When taught properly, it can provide the opportunity to go within and affect our physical body in surprising ways.